Gibson highlighted his professional career as a commercial banker for 25 years. “I’ve lent millions of dollars to small businesses in this community. I’m hoping to earn your vote and give back to the community that we call home,” said Gibson. Nathan Parchman, a resident since 2007, moved here after graduating from Murray State University because his wife, Nicole, is a born and raised O’Fallon girl. Parchman has been in finance and banking for the past 14 years and indicated working in O’Fallon is a priority to him. He highlighted his service to the community through the Rotary Club of O’Fallon, Chamber of Commerce and as a youth coach. “I’ve attended nearly every council meeting for the past 6 months, and that’s been important for me to get to understand and to know the aldermen and understand how the processes work. Living, working, playing and investing in O’Fallon is a priority to me. I care about O’Fallon because it’s my home and it’s all of yours too,” said Parchman. Parchman received the first random question about one thing that has stuck with him at a recent city meeting he attended. Mobile food vendors and charity roadblocks were the two specific items Parchman mentioned. “They both don’t seem like major issues, but they raised a lot of concerns with the citizens.” He said he recently took a Facebook poll about the roadblocks and got community feedback regarding safety concerns, traffic delays, and if removed what would be the impact to the community and how organizations would raise that money otherwise. “It opened my eyes to the concerns on both sides because when I cast my vote, it’s not just for me it’s for the entire community. So opening my eyes to not what my opinion is but what everybody else’s is. It did allow me to see other perspectives and not just my own,” Parchman said. Gibson was asked about his vision for economic development for O’Fallon. “As a commercial banker and having lived in the community for 23 years now, economic development is obviously key to the growth and the future of the city. I think it’s really important we grow smart. I think we use the resources that we have available to us, tax incremental financing (TIF). The more businesses that we can have that generate sales tax, I think that revenue obviously goes to our coffers and allows us to continue to grow in a smart way. One of my hopes and visions is to continue the growth that’s already taking place, and continue to grow smart. We all have to contribute to the greater good and find a way to continue to develop smartly in O’Fallon, both commercial and residentially,” Gibson said. The ward-specific question asked of Gibson and Parchman was what their approach would be to approving planned use agreements, particularly if some of the residents in that area disagreed with the proposal. 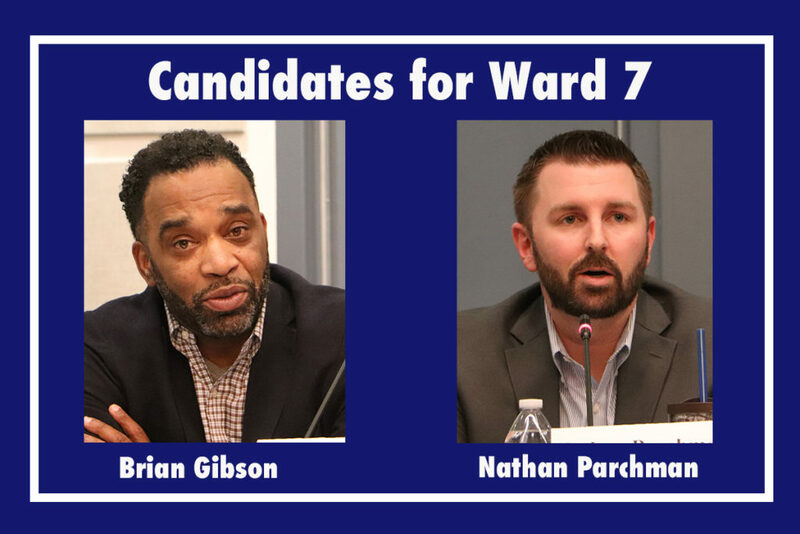 During closing remarks, Parchman pointed out that while he lives in Ward 7, he also owns a rental home in Ward 3 so he understands the downtown issues. “I’m not just a Ward 7 person only, I’m a city person,” said Parchman. “I’ll do my best to insure your taxes are spent wisely. It’s our due diligence, if I’m elected to council, to spend the city’s tax dollars and your tax dollars properly.” Parchman also referenced his fourteen years of finance experience working with budgets. “I’ve spent numerous hours in the community parks, I think they are an absolute asset to this community. We should continue to develop those. Again, being a banker, commercial development is critical for the growth of O’Fallon…smart growth. Residential development, I think we have to continue to grow. Obviously we don’t want to lose that home town feel, but the reality is we live in a desirable community, so we can’t be afraid of that growth. As an alderman for Ward 7, I hope to be able to bring my expertise and my experiences, my leadership of being an executive in a billion dollar financial institution. My hope is to be able to provide some insight, some diversity, and some differing opinions for the council,” Gibson said in conclusion.